It is no mystery that LED technology has evolved greatly during the past several years. We are now up to the point where anyone can buy LED lamps to replace HPS fixtures, with full spectrum LED configurations that have showed to be just as good - or sometimes even better - at growing crops (see here for a post about LED lights Vs HPS). However these lamps are often very expensive - most commonly around thousands of dollars to adequately replace a 1000W HPS. Within these series of posts I am going to talk about how you can build your own LED lighting to replace HPS lights for pennies on the dollar compared to commercial LED fixtures. WARNING: Mains voltages (110-220V) can be extremely dangerous. Please make sure that you know what you're doing if you're going to follow these instructions. All of this information is provided "as-is" with educational purposes only. Make sure you follow all safety precautions when working on mains electricity. There are several ways in which you could build your own LED lamps. This usually involves building an aluminium case with fans, putting an LED driver inside and then using that driver to power rows of different light emitting diodes. A driver is basically a transformer not unlike a computer PSU that takes voltage from the mains and dials it back down to a lower voltage that you can use across a row of diodes. Most commonly commercial lamps use combinations of 3W diodes with narrow focusing elements with sometimes higher wattage elements with wider focusing elements. Building a configuration like this can be done but it is a laborious that we can avoid using some of the latest advances in LED technology. To make a simple high power LED lamp we should absolutely forget about putting together LED elements of different colors. This involves a lot of wiring and makes the lamp fundamentally more expensive. To replace them we can use white diodes instead which although far less efficient - as they are basically blue diodes whose light is absorbed and re-emitted by a phosphor - can give us all the different colors we need in the proportions we need them. The image above shows you the spectrum of different white diodes, as you can see we don't want the 5000-8000K or 3700-5000K LEDs - which emit a lot of blue light we don't need - but we need the much "warmer" 2600-3700K diodes which produce a lot of light in the red region of the spectra, with enough blue to provide us with close to a 1:3 ratio. Although this light spectra is still not ideal compared to what plants absorb it will easily able to replace a 1000W HPS. 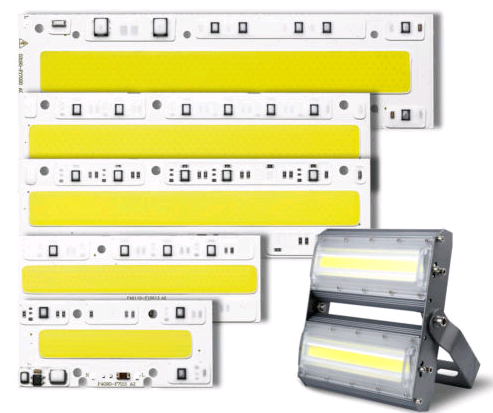 To make things very simple and avoid using a separate driver we can use 150W LED cobs that include their own driver and are fed directly with 120/240V electricity (like the ones here). As I mentioned we want the lower temperature spectra white diodes so go for the "Warm white" and make sure the temperature description says it is at least 3200K or lower (if you're looking at another source). The publication above contains 150W cobs that can do 2500-3200K so they can be considered ideal for this application. For every 150W cob you install you should also install a 2A AC fuse for that cob only to ensure that if anything bad happens the power will be cut almost instantly. Since these cobs are wired directly to mains electricity you should be specially careful with having proper safety precautions (proper soldering of the wires, solders protected with isolating material (like silicon) fuses for each cob, etc). Of course the cobs are only half the setup. We need to place these cobs on top of an appropriate heatsink and then also ensure we have fans for it. You can buy a properly sized aluminium heat sink here. Since cobs measure 16x40 we can comfortably glue two cobs to the bottom of a heat sink of profile A (146x22mm) with a length of 400mm. To glue the cobs to the heatsink you should use proper arctic silver thermal adhesive (you can find it here). For fans you can place 2 12cm Fans on top of the above. There are several fans that work with 120-240AC that you can use, for example these fans work with 120V. This setup will give us a 300W LED lamp, with 2 fans that should be able to keep the heatsink temperatures in check. All of this for a total of around 83 USD, let's call it 100 USD after adding fuses, cable and other parts you might require. The above lamp will not replace a 1000W HPS on its own, for this you will need at least 4 cobs - meaning two of the above lamps - which should give you 600W of LED power that should be close to the PAR of a 1000W HPS light. This for the cost of only 200 USD (far less than the commercial LED replacement lights). I am in the process of making my own so I will be able to give you some additional details as soon as I get the parts and finish building my own setup. In part No.2 of this series of posts I'll show you the results of my work and what it does in terms of photon flux and PAR. Dear Dr. Fernandez, I really appreciate your advocacy in teaching hydroponics technology online. In a growroom full of grow lights led, is there an ambient temperature that we need to watch for as the led heats up? Hi Daniel. I am confused why you tie into the main breaker, it seems a bit unnecessary for the task at hand.